In both Britain and Australia broad-based reform programs aimed at reducing the regulatory burden and improving the quality of their regulatory systems and the resulting output of regulation have been in place for several decades. Within that ongoing reform context both countries have had in place formal regulatory impact assessment (RIA) systems that aim to ensure the minimum appropriate, best quality regulation. In Australia in 2006 and in Britain in 2007, reports were released by the British and Australian Commonwealth governments in relation to their respective RIA (Regulation Taskforce 2006, Better Regulation Executive 2006). While both reports recognised the value of the RIA processes in place, both also indicated shortcomings and put forward a number of recommendations for their improvement. The bulk of the recommendations were accepted and revised RIAs incorporating the recommended changes were implemented in Australia in November 2006 and in Britain in 2007 (Australian Government 2006a, Australian Government 2006b, Office of Best Practice Regulation 2007b, Better Regulation Executive 2007a). Similarly, both sets of recommendations were implemented within the context of a broader set of regulatory reforms (COAG 2007, Department for Business Enterprise and Regulatory Reform 2007a). The aims of this paper are to: one, identify and compare the motives for the reforms, which is considered in the first section; two, in the second section compare a selection of the major reforms endorsed and implemented; three, in the final section examine the role of the national audit offices in relation to regulatory performance and assessment. 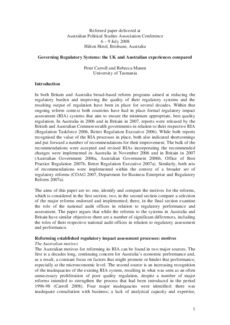 The paper argues that while the reforms to the systems in Australia and Britain have similar objectives there are a number of significant differences, including the roles of their respective national audit offices in relation to regulatory assessment and performance.